The National Commission on the BP Deepwater Horizon Oil Spill has released a chapter from their final report due on January 11, 2011. In the chapter, which is blunt in its assessment, they assign primary blame for the disaster to mismanagement by BP, Halliburton, Transocean, and the lack of proper regulatory oversight. The blowout was not the product of a series of aberrational decisions made by rogue industry or government officials that could not have been anticipated or expected to occur again. Rather, the root causes are systemic and, absent significant reform in both industry practices and government policies, might well recur. "My observation of the oil industry," stated Commission Co-Chair William K. Reilly in a press release that announced the chapter's conclusions, "indicates that there are several companies with exemplary safety and environment records. So a key question posed from the outset by this tragedy is, do we have a single company, BP, that blundered with fatal consequences, or a more pervasive problem of a complacent industry? Given the documented failings of both Transocean and Halliburton, both of which serve the off shore industry in virtually every ocean, I reluctantly conclude we have a system-wide problem." A key chapter from the National Commission on the BP Deepwater Horizon Oil Spill's final report shows the panel is pulling no punches in assigning blame for last April's oil rig explosion. That blast killed 11 workers, seriously injured others and created the largest oil spill ever in American waters. When William Reilly became the co-chairman of the commission, he expected to uncover a story about one bad actor: BP. Instead, he found that Halliburton and Transocean were deeply implicated. "I was surprised and shocked," Reilly says. The released chapter opens with a quote from an email by a BP engineer in the lead-up to the disaster: "But, who cares, it’s done, end of story, [we] will probably be fine and we’ll get a good cement job." “The Commission’s findings only compound our sense of tragedy," Co-Chair Bob Graham said, "because we know now that the blowout of the Macondo well was avoidable. This disaster likely would not have happened had the companies involved been guided by an unrelenting commitment to safety first. And it likely would not have happened if the responsible governmental regulators had the capacity and will to demand world class safety standards. There is nothing that we can do to bring back the lives of the men we lost that day. But we can honor their memory by pledging to take steps necessary to avoid repeating the fatal practices of the past." • An ineffective response to the blowout once it began, including but not limited to a failure of the rig’s blowout preventer to close off the well. The chapter reports that these failures were preventable. 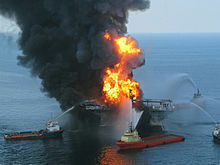 Errors and misjudgments by at least three companies -- BP, Halliburton and Transocean -- contributed to the disaster. Federal regulations did not address many of the key issues -- for example, no regulation specified basic procedures for the negative pressure test used to evaluate the cement seal or minimum criteria for test success. The chapter also notes, "Whether purposeful or not, many of the decisions that BP, Halliburton, and Transocean made that increased the risk of the Macondo blowout clearly saved those companies significant time (and money)." The Commission’s full report will be released on January 11th.